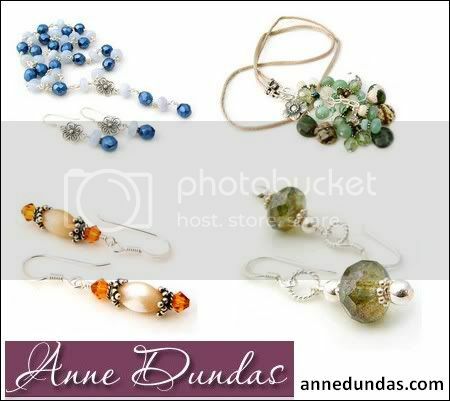 About 2 weeks after I ordered my jewellery from Anne Dundas, I received my package! Shipping was quick – under 2 weeks from Australia to Malaysia and it came in a bubble envelope to protect the precious cargo inside. These are the 2 items I ordered. The first is a lampwork bead pendant on a silver chain. 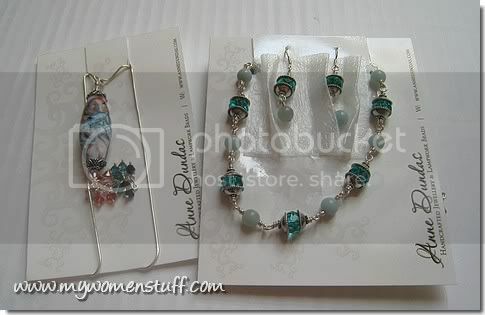 The other is a long necklace set with matching earrings. USB Crystal Hearts For your Valentine : Geeky or Sweet? Are you still looking for that perfect Valentine’s Day gift? 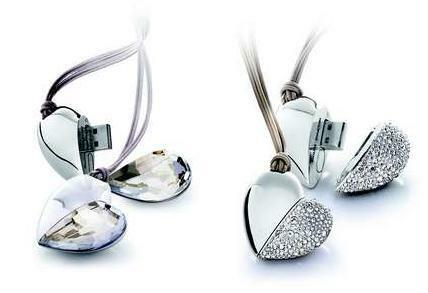 Well, how about this Active Crystal Heart pendant by Philips that comes with a 1GB USB memory? This pretty fascinating item is a collaboration between Philips and Swarovski crystals. The stylish pendant comes with stainless steel on one side and crystals on the other. Open the heart pendant and a USB port is revealed. Light Drop Jewelry was created by one woman with the desire to enliven and inspire people. These special, handmade necklaces reveal words on both sides that spark the spirit and evoke human emotions. Made from glass, the unique pendants look like little drops of light around your neck. Light Drops can be fun and/or spiritual in nature ,and each is an original work of art. Light Drops make the perfect gift for someone you love. With many inspirational and religious words and phrases, Light Drop necklaces can be reminders of spiritual goals. You can wear the more light-hearted combos to remind you of the fun in life. Or, you can personalize a pendant with words and phrases that are near and dear to you. When I saw the pictures of the collection on the website, I had the impression that the pendant was a flat disc with words inscribed on the inside, that could be worn either way. However, when I received it, I realised that it was not a flat disc at all, but a glass drop with wire around its middle, and it was a little larger and heavier than I expected. 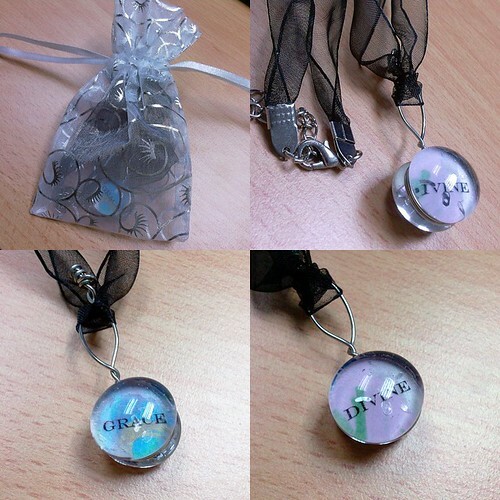 Here are the pictures of the one I received – one side says Grace and the other says Divine. The glass drop does look like a light drop and it is truly a unique piece of jewelry that is pleasing to the eye. It comes on an organza ribbon with a clasp for you to wear around your neck and it is worn as a short necklace. I am quite impressed by it, honestly, because I’ve never seen anything like it, and I like the inscriptions in it, which you can choose to customize. These pendants are available to order online and cost US$30 for the pre-made inscriptions and US$45 for the personalized ones. The website doesn’t mention if they ship outside of the USA, but if you are outside of the USA and are interested, try emailing Jo Anna through the contact form on the site. She’s very friendly and helpful and I’m sure something can be worked out.